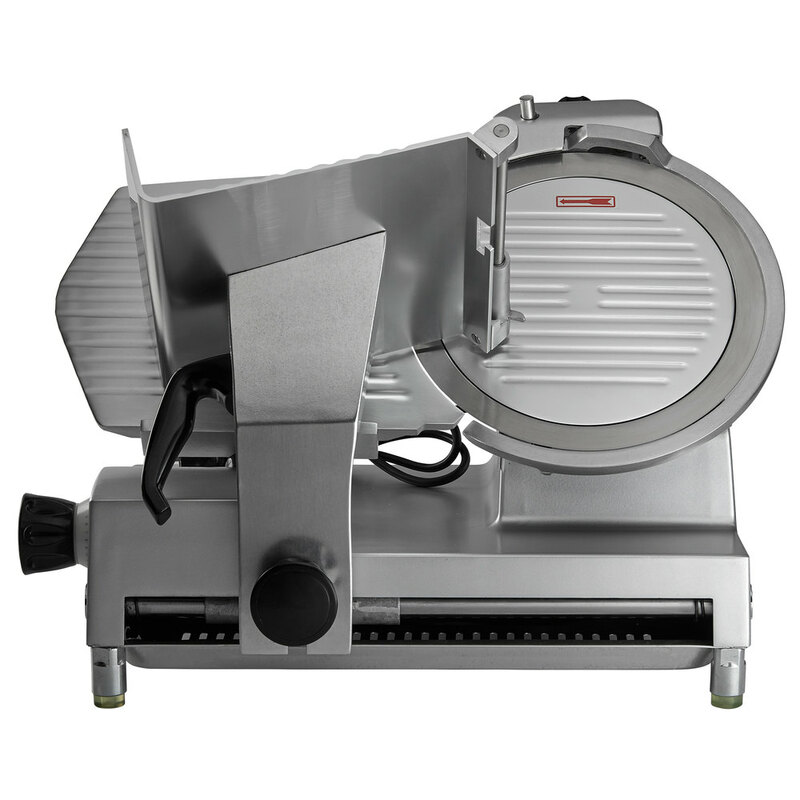 The Avantco SL512 12" manual gravity feed slicer features a compact design that's ideal for small operations where space is at a premium! It's great for slicing vegetables and processed meat for several hours a day, making it great for delis, coffee shops, sub shops, and small restaurants. It's also easy to use, with adjustable slice thicknesses from 1/16" to 1/2". This slicer is made of top quality aluminum for durability and easy cleaning, and it features a built-in sharpening assembly. The meat carriage is also removable for easy cleanup, and a fixed ring guard provides safety. For optimum power, the stainless steel blade is belt-driven by a 1/2 hp motor. 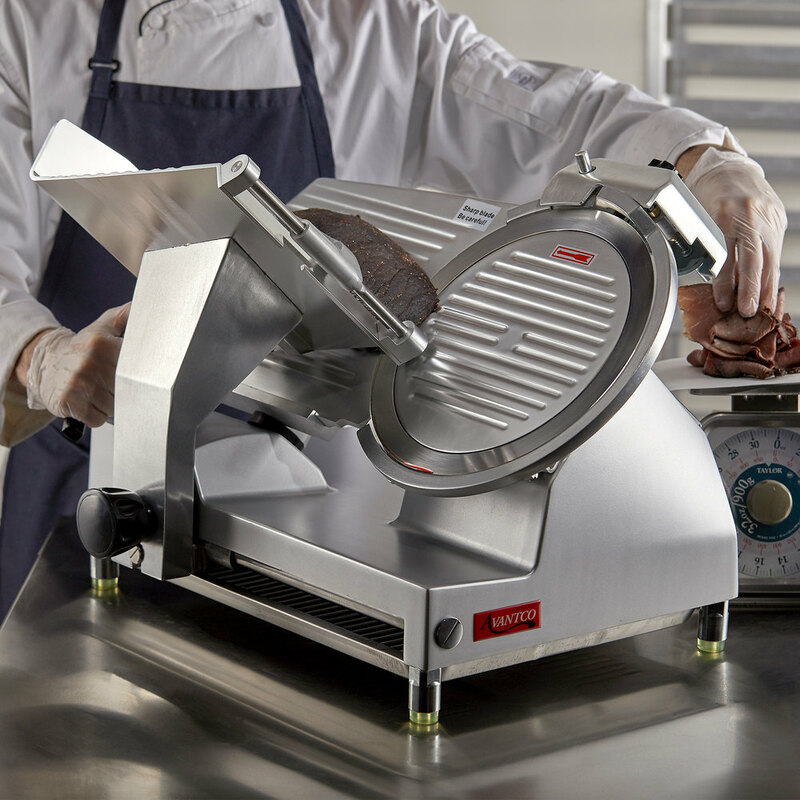 The Avantco SL512 is appropriate for medium-volume applications of up to several hours of slicing per day. While it can handle continuous use, it is not suitable for slicing raw or frozen meat, and it should not be used to slice cheese for more than 30 minutes per day. Maximum Product Size: 11" x 8"
This is by far the best slicer I have ever used. It effortlessly slices through meat, on the thinnest setting it does not shred the meat or cheese. My customers are extremely happy now that we have actual slices instead of pieced together product. Lacy F. from Forstanner Investments L.L.C. We decided not to open our deli, so we don't use it nearly as much as we intended. However, we do use it periodically to slice turkey and tri-tip for sandwiches and it works great for that. It's a great unit for the price in a light to medium duty applicaiton. We needed something to slice blocks of cheese for sandwiches. This is very efficient and works perfectly. We also use it to slice tomatoes and onions. Very happy with this and it has not let us down. This slicer is great, It not only cuts every type of lunch meat you throw at it, it is also powerful enough to slice most block cheese that is 4x4, or 4x6 square inches or less. I have used this slicer for more than 8 meat loaves thus far and it still is as sharp as when I purchased it new. Have not even had a chance to use the included sharpener. This machine is very useful because it cuts meats at different sizes. It is sturdy and easy to use. It is very good for deli meats and has a variety of sizes one could choose from. I was nervous buying our first slicer but this thing is doing a great job for us. We slice all of our meats and cheese's for our toasted fresh and this thing works great. wow, this avantco sl512 12' manual gravity feed meat slicer is very good, you can slice a lot of different things on this too, strongly recommend this product. This truly is not for a food service business. This machine has way to many parts to clean, does not open very wide. It is a great machine to use occasionally, price is right. If you are looking to a machine to use on daily basis, invest a little bit more money will be worth it. Fine piece of equipment here, we use it for a bunch of different items, never has failed us. Easy to clean and by far my favorite slicer made! Great buy! This slicer was a replacement for a couple of really old Hobart machines that got too expensive to keep repairing. The Avantco arrived with some freight damage, but the folks at Webstaurantstore replaced the parts that were damaged. The slicer works great. It does take some getting used too as far as cleaning, but once you get used to removing the blade it's not too bad at all. A great value considering a Hobart is more than triple the price. For the price, an excellent value. The motor runs strong, cool, and quiet. The blade as it comes is sharp and seems to maintain its edge. It is overall easy to clean. We run cheddar cheese through it for hours at a time and it has no trouble keeping up. we LOVE this slicer! We use it literally everyday and have been for several years. Its accurate and heavy duty and just as good any any of the brand name ones we have used. Writing to speed up the search comparisons for everyone. The boxes typically ship with some cardboard damage because the package is VERY heavy and it is easy to damage the box in shipping. You will understand when you pick the box up with a friend off your porch. The adjuster to my meat slicing depth operates off a plastic cam wheel under the unit and mine was broken when it arrived. I am betting the mfr. ships these set hard to stop vibration which makes them prone to break during shipping. If yours comes and the depth adjuster seems to not work check the cam. Webstaurant did great, I sent a picture of the broken part and a replacement cam was sent but you must figure out how to replace it. Some quick QA for the low end home/recreational user. Can it slice the dreaded cheeses everyone uses for comparisons and meats and (anything) for hours on end? YES. The blade is massive and heavy, the inertia of the blade alone does a lot of the work, the entire unit is very heavy, my wife could never lift this thing. Picture your local deli, look at the slicer, and then you will understand. You will (not) be moving this item either at all once it is in place. I'm 6'4 and quite strong and this thing stays in one place as its forever home - so please don't accidentally kid yourself that you will be taking it in and out of storage when you need it. Set it in place, cover with a cloth or towel. Forever home and I mean it. Why is it cheaper? It is made with more simplistic construction. Nuts, bolts, belts etc. It all works fabulously together but does best if the operator is fine with adjustments with wrenches to make it "perfect". It absolutely shaves from zero (not slicing anything) to 1/4 inch with infinite adjustment inbetween. The reason it is not more expensive? The unit is (not) designed well for rapid complete disassemby. Those higher end commercial units come apart with only big knobs (no drivers or wrenches needed) for daily disassembly or rapid cleaning between different meats or cheeses. The blade removal on this unit is a little scary. No handle to attach, you grab, lift and carefully wash. So if you are a smaller business, doing limited business or home processing you will be elated and happy. It is impressive and effective for slicing any food. If you are paying employees to stay and clean or must do total cleaning daily and or several times a day then you should bite the bullet and pay double or more to get a rapid teardown, clean, and reassemble unit. 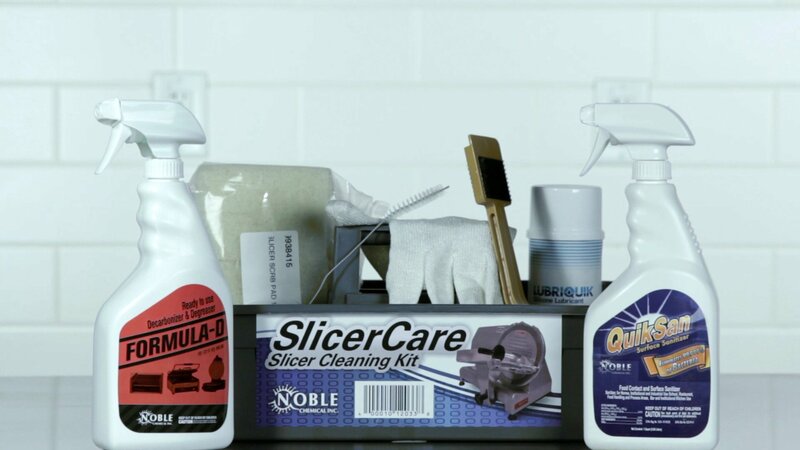 I'm a home use guy and this product works far beyond my expectations and I have time to clean slowly and patiently. All the other silly retail store slicers or "add on" slicers to your other kitchen appliances are a joke in comparison. I could probably have gotten by with a lower horsepower unit for my home smoking and cooking - but I felt like splurging on myself and I am not disappointed. Del F. from Del S.
This meat slicer has become a feature of our deli. Once you figure out how, it isn't too hard to clean. Greasing up the sliding part with some nonstick spray is a pro-tip I'd like to share. This Avantco meat slicer is a good quality slicer and the price is great! The meat slices perfectly and the machine is easy to use. Great slicer for the price! Came damaged on the bottom, but is expected due to the light/thin material it is made out of. Over all it has sliced through raw, cooked, and frozen meats without effort. Only critique is the guard surrounding the blade makes it difficult to effectively clean without taking the blade off. Mike S. from C. M. SMOKE ARTISAN BBQ INC. I'm having trouble adjusting the cutting edge height for my slicer. The knob goes 0-4, but then feels like it runs into a lock. What am I missing here? Is there a lock on the height control knob? I'm a beginner with a meat slicer and have tried to push, pull, twist on the knob but I'm feeling defeated. Can someone help me out by giving me some pointers, the manual is less than helpful on the matter and I can't find anything online. The videos just tell me how awesome it is, but I have yet to feel that excitement. Help, please. I just want to cut some ham and bacon. We needed a heavy duty, commercial meat slicer but only for occasional use so we didn't want to spend a lot. For the price, this is exactly what we were hoping for! It does the job perfectly and is easy to clean too just as a commercial one should. The only issue we had was trying to clean around the blade guard. So we decided to take the entire blade off every time we clean it to be sure. Also we had to get a Berkel cover for it that is a little over-sized since I couldn't find one specific to this. 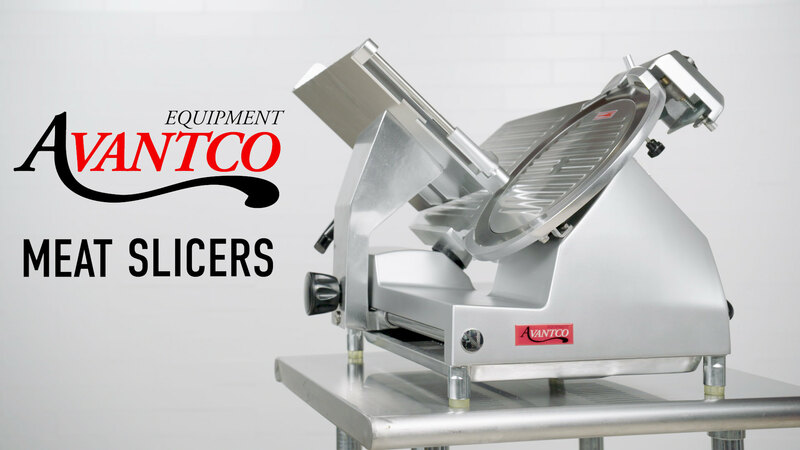 The Avantco SL512 Manual Gravity Feed Meat Slicer is also capable of slicing cheese. At this price point it was the only option to both meat & cheese! We've put over 1000lbs of bacon through this since we got it - overall we're quite pleased. Minor quibbles - we had to start chilling the bacon below fridge temps to get it to slice cleanly. When you draw the carriage back, the fat would smear on the blade, and on the next slice, it transfers to the meat, leaving a perfectly tasty but frankly gross looking fat buildup on the slice. First of all, Web restaurant store shipped my slicer very quickly. Since I reside in the next county from their location, my slicer was delivered the next day after ordering. It arrived, in good order, in a large box with a thick styrofoam liner, in which the slicer was safely nestled. I unpacked the slicer and managed to pick it up (it weighs about 65-70 lbs) and placed on it's permanent location. I immediately noted that it appeared to be very well made, and, obviously, a professional grade slicer. Fit and finish is very good. 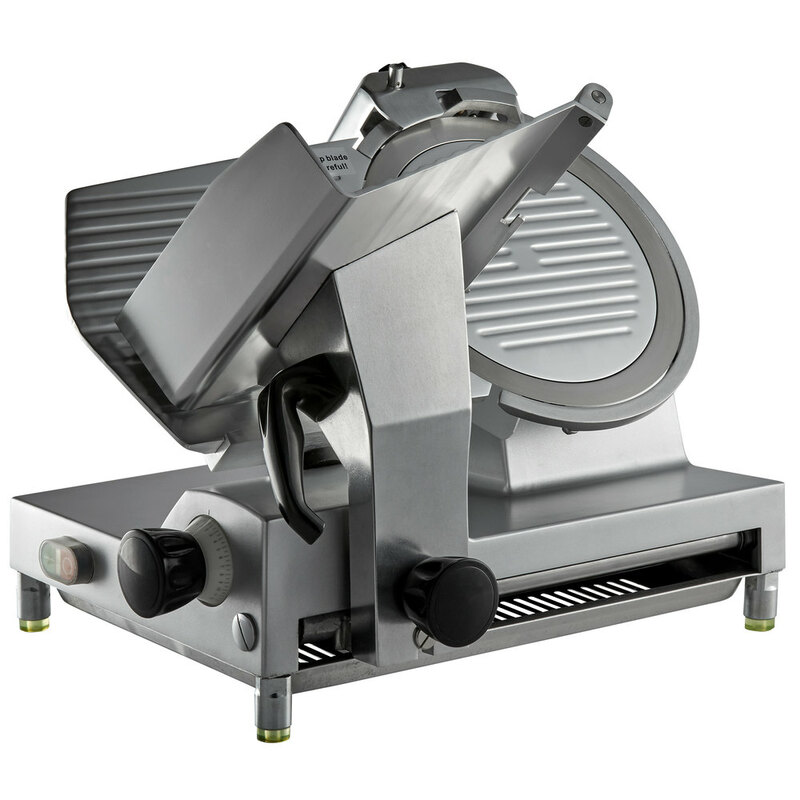 The Avantco SL512 slicer is a great value for the money and functions professionally. My first test was to slice chipped beef. It did a fantastic job. My second test was slicing various deli meats. It sliced them perfectly. I have no complaints with the function of the machine, it works exactly the way it should. Now, having stated all of that, the reason I only gave it a four-star rating is for the following reasons. The manual is not clear on several points, apparently, written by someone who's first language is not English. Some instructions make no sense, especially the sharpening section. Some reviews have mentioned that it's hard to clean. I don't find that to be the case. Actually, it's very easy to clean, but there is one task that could be easier, which is removing the blade. The 12" blade is easily removed by taking out four screws, however, it's a bit clumsy to handle because of it's weight and size. I used two very powerful magnets, with handles on them, to pull the blade off of the slicer with one hand, while grabbing it with my well protected other hand. Once the blade is off the slicer, it's very easy to clean and disinfect. Other than that, the slicer comes apart very easily and is very easy to clean, even if you have never used a slicer before. There are only three knobs to undo for disassembly. It's fairly obvious and very simple to take apart. If one studies the machine, one doesn't really need instructions. However, a novice may find it intimidating. I have been using slicers since I was about 10 years old in my parents hotel, so it was easy for me. The sharpening is very obvious also. There are other design improvements that could be made to this slicer, however, this would increase the cost of the machine. If one wants the ultimate in innovative design and function, then the Hobart or Berkel are available for two to three times the price. Again, this machine is an excellent value for the money when compared to the higher end machines, and functions just as well. Nicholas B. from Nick B. We have had this meat slicer for 3 years with no issues. Good product hope I never have to order another one but would needed. Great general purpose slicer, although we still have problems with the blade catching when trying to cut cheese. If you are cutting cheese go to the higher horsepower. I was unsure about this brand when I purchased it but Avantco has been very reliable for me so far. I use this machine daily in my bar & grill to slice meat and cheese and it works great. Fairly easy to clean although you do need a screwdriver to take the blade off. Not a big deal though and only takes a few seconds. Overall I am satisfied with the performance and quality! Shipping and product are top notch. We currently use everyday to give fresh product to our customers. Very quiet motor to help keep noise down in the kitchen. I found this slicer to be very easy to use and simple to clean. I had bought a different slicer but it didn't like. Im very pleased with this one. I was a little nervous about buying this slicer because i didn't know much about this brand. But I'm glad i took a chance it is very good quality I thought it was going to be light but it has some good weight to it. Ive had it over a year now and still works great. I am definitely a fan of the Avantco slicer.